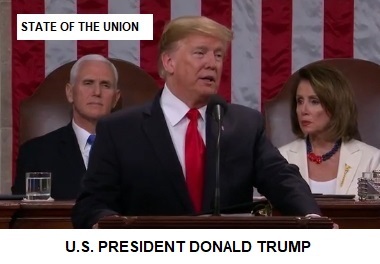 CBJ — U.S. President Donald Trump delivered his second State of the Union address in Washington, covering a wide variety of topics, including the economy, border security and illegal immigration, the new USMCA trade deal and the military. President Trump urged a divided Congress to work with him to pass legislation improving U.S. infrastructure and addressing the high cost of prescription drugs. A group of Democratic women just stood to cheer as Trump was discussing the increasing number of women in the workforce. The women were all dressed in white, the colour historically associated with the suffragette movement. “No one has benefited more from a thriving economy than women who have filled 58% of the newly created jobs last year,” Trump said. Trump then urged the women to remain standing. “Don’t sit yet. You’re going to like this. And exactly one century after Congress passed the constitutional amendment giving women the right to vote, we also have more women serving in congress than at any time,” he said. Speaker of the House Nancy Pelosi stood up after that line, and gestured for other Democrats in the room to do the same. “My administration has sent to congress a common-sense proposal to end the crisis on the southern border. It includes humanitarian assistance, more law enforcement, drug detection at our ports, closing loopholes that enable child smuggling, and plans for a new physical barrier or wall to secure the vast areas between our ports of entry,” Trump said. Another partial government shutdown could occur on February 15 if an agreement is not reached between Trump and the Democrats on funding for border security. However, Trump did not say he would invoke a national emergency clause to get the wall built. House Speaker Nancy Pelosi, who was seated directly behind Trump and next to Vice President Mike Pence, shook her head at Trump’s mention of investigations. Trump also took time to honour several military personnel as well as several other special guests, including a 10-year-old girl battling brain cancer. Trump announced a second summit with North Korean Leader Kim Jong-Un on February 27 and 28 in Vietnam. The speech lasted about 90 minutes. Conclusion d’un accord de principe visant une opération admissible entre Capital Orletto II inc. et Sigma Energy Storage inc.